Chia Pudding! | Eat More Plants. Chia pudding is one of my favorite raw foods. It’s so satisfying and totally good for you. I make it once a week and it lasts 4 or 5 days in the fridge, providing I don’t finish it before then. If you’re into making your own nut milks, you can use that for chia pudding. Otherwise buy whatever milk you prefer; almond, soy, coconut, etc…I’ve never made pudding with anything but nut milks but it’s all about the right ratios. The milk is just your preference of taste. Use 1 cup of milk per 2 tablespoons chia seeds, white or black or mixed, doesn’t matter. Add in some flavoring, a 1/2 teaspoon cinnamon per 1 cup milk works great. To make chocolate chia pudding add in 1/2 tsp carob or raw cocoa powder. Vanilla been seeds are my favorite seasoning! I usually add in half a bean scraped out per 2 cups milk. Now whisk your ingredients together and leave your bowl out on the counter. Come back and whisk every few minutes. This will prevent your chia seeds from clumping together. Very important! Otherwise you’ll end up with plain milk and jelly-like chunks of chia seeds. Whisk every so often for about 15 minutes and then refrigerate for at least 4 hours. I add a splash of maple syrup before I eat it, just to give it some sweetness. Top with berries and/or nuts. I served my daughter some chia pudding with goji berries today in her favorite fashion: edible bowls. I sliced the top of an apple and scooped out enough room to pour some pudding in. 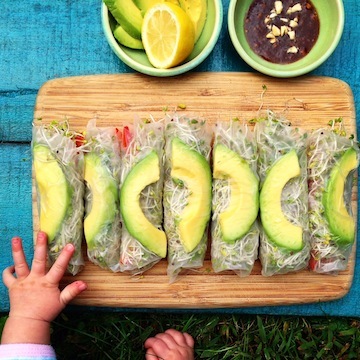 You have to be creative sometimes to get kids to eat healthy. Whatever works! Amazing! 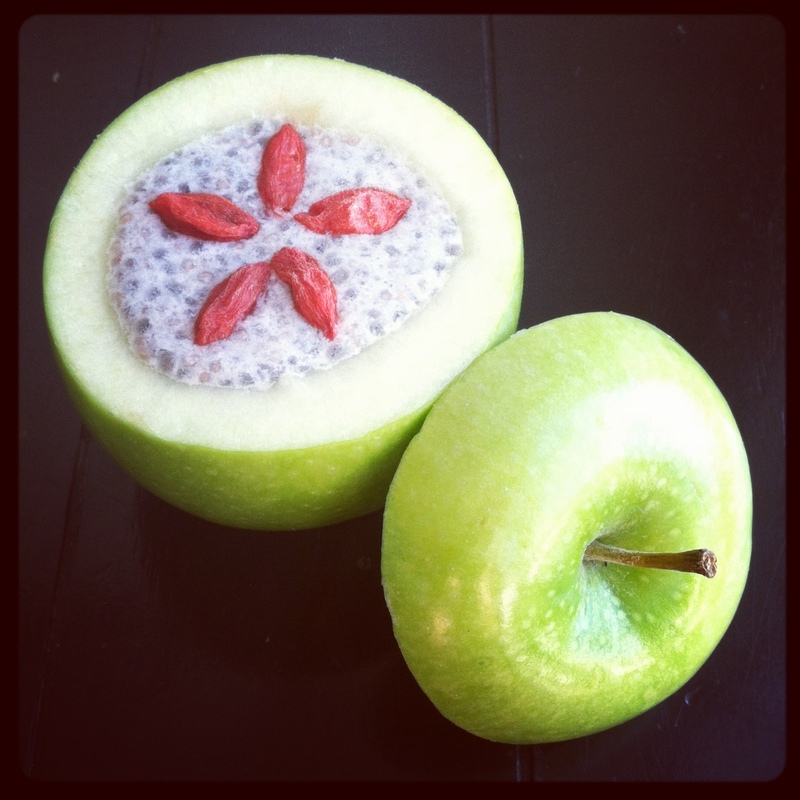 Chia is on my list of foods to try… this looks beautiful! What does it taste like? Does your daughter actually like it? Yes she loves it! Only in the apple though…hmm lol. The chia seeds absorb the liquid so it has a great pudding texture. It’s not so rich like a dairy based pudding but the seeds have tons of fiber so it fills you up! It reminds me of rice pudding actually. The maple syrup gives it the perfect touch of sweetness without overpowering the other flavors. Try it!